Introduction: Diabetic Foot ulcer is the commonest burning problem in the society. Many histopathological studies show prolonged inflammatory phase in diabetic wounds. In Sushruta Samhita, Vimlāpanakarma (gentle massage) quoted, as first line of treatment for Vranashotha (inflammation). Case Report: A 70 yrs old male patient, presented with complaints of ulcer associated with severe pain and reddish skin discoloration over ventral aspect of 3 rd toe of right foot since 2 months. Vimlāpanakarma performed with Jātyādi taila around the wound for about 15-20 minutes daily for 10 days and follow-up done for period of 45 days. Discussion: By Vimlāpanakarma with Jātyādi taila there will be raised local temperature, due to which vasoconstriction is relieved and necessary nutrients, oxygen, insulin etc. are carried to the wound site, thereby improving the anoxic condition of wound. Conclusion: Vimlāpanakarma showed significant role in wound healing of Diabetic Foot ulcer, in a short period of time 10 days with no recurrence seen till 45 days follow-up. A 70-year-old male patient, presented with complaints of ulcer associated with severe pain and reddish skin discoloration over a ventral aspect of the third toe of his right foot since 2 months [Figure 1]. Patient was said to be healthy and asymptomatic 2 months before this, he noticed small bleb over the third toe of right foot, which burst out into ulcer and went on increasing in size with severe pain and reddish skin discoloration around it. He consulted a nearby physician and got wound dressing daily but did not get relief. Following this, he approached our hospital in search of better treatment. According to his statement, it was found that the pain was severe and of burning type and the ulcer was increasing in size every day with foul smelling and pus-like discharge through it. Patient is k/c/o diabetic since 8 years and was on medication using tablet glycinase 1 bid. There was neither H/O hypertension nor any other chronic illness. Patient was addicted to beedi (a type of cigarette filled with tobacco flakes and wrapped in Bauhinia racemosa leaf) smoking from past 30 years but had stopped it since the past 2 years. The case was diagnosed clinically along with hematological reports as DFU of Grade-II Wagner's classification for DFU. The procedure was carried out in aseptic conditions wearing surgical gloves. Jātyāditailam was applied all around the ulcer, and vimlāpanakarma was carried out. The size of the ulcer was small and place of occurrence was in the toe region and hence a single thumb with the pulp of the fingers were used for vimlāpanakarma around the ulcer followed with Jātyāditailam dressing and bandaging. No internal medications are given during the treatment period [Figure 2]. Vimlāpanakarma was performed with Jātyāditailam around the wound for about 15-20 min daily for 10 days and the patient was followed-up over a period of 45 days. The results were evaluated by subjective and objective parameters mainly based on clinical observation by grading method. The pain was assessed using visual analogue scale and the wound (vraṇāākṛti) was measured in centimeters with the help of thread and scale method, graph method and photography before, during and after the treatment. Vraṇalakṣaṇas were graded as symptomless (−), mild (+), moderate (++) and severe (+++) [Table 1]. The key feature of wound healing is the stepwise repair of lost ECM that forms the largest component of the dermal skin layer. This is possible only when the obstruction in the blood capillaries present at the site of the wound is relieved. Gentle massage using Jātyāditailam with the help of the thumb and pulp of the fingers leads to rise in the local temperature. This in turn leads to relieving of vasoconstriction and thereby the necessary nutrients, oxygen, insulin etc., are carried to the wound site. It is through this mechanism that the anoxic condition of wound is alleviated and it helps in the regeneration of the epithelial cells and heals the wound in a shorter duration of time, when compared to the other wound healing processes seen in the DFU. 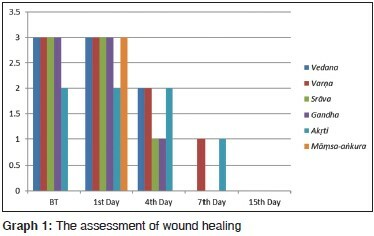 Vimlāpanakarma showed a significant role in wound healing of DFU, in a short period (10 days) with no recurrence seen till 45 days follow-up [Figure 3]. When compared with other contemporary treatment modalities, vimlāpanakarma seems to have superior effect coupled with its ease to practice. It is also time-saving, cost effective and provides convincing results in a diabetic ulcer. Further study of vimlāpanakarma can be carried out to evaluate its efficacy in other chronic non-healing ulcers such as varicose ulcers, trophic ulcers, etc. Timely practice of vimlāpanakarma will help avoid the further complications of the ulcers such as gangrene and will help prevent amputation. Bowling FL, King L, Paterson JA, Hu J, Lipsky BA, Matthews DR, et al. Remote assessment of diabetic foot ulcers using a novel wound imaging system. Wound Repair Regen 2011;19:25-30. Rosai J. Acreman's - Surgical Pathology. 8 th ed., Vol. 3. 1996: Mosby Publishers;St. Louis, USA. Sharma PV. Suśruta Saṃhitā - Nibandha Samgraha Vyakhya; Dalhana Teekah, Sūtra Sthāna. Āmapakvaiṣaṇīya Adhyāya; Shloka no 17, 18. Ch. 17. Varanasi: Choukambha Orientalia; 6 th Edition, 1997. p. 72-3. Sharma PV. Suśruta Saṃhitā - Nibandha Samgraha Vyakhya; Dalhana Teekah, Cikitsā Sthāna. Dvivraneeya Adhyāya; Shloka no 22. Ch. 1. Varanasi: Choukambha Orientalia; 6 th Edition, 1997. p. 5. Shastri KV. Suśrutasaṃhitā - Ayurveda Tatva Sandeepika; Hindi Commentary, Sūtra Sthāna. Āmapakvaiṣaṇīya Adhyāya; Shloka no 17, 18. Ch. 17. Varanasi: Choukambha Orientalia; 6 th Edition, 1998. p. 72. Glynn LE, editor. The pathology of scar tissue formation. In: Handbook of Inflammation. Tissue Repair and Regeneration. Vol. 3. Amsterdam: Elsevier/North Holland Biomedical Press; 1981. Martin P. Wound healing - Aiming for perfect skin regeneration. Science 1997;276:75-81. Pierce GF, Mustoe TA. Pharmacologic enhancement of wound healing. Annu Rev Med 1995;46:467-81. Buffoni F, Banchelli G, Cambi S, Ignesti G, Pirisino R, Raimondi L, et al. Skin wound healing: Some biochemical parameters in guineāpig. J Pharm Pharmacol 1993;45:784-90. Kunte AM, Navre KR. Astanga hrudaya-composed by Vaghbhata commentaries by Sarvanga Sundara of Arunadatta and Ayurveda Rasayana of Hemadri; coliated by edited by Vaidya BH. Cikitsā Sthānam Svayathu Cikitsitam. Ch. 17. Varanasi: Krishna Das Academy; 8 th Edition 1998. p. 705. Sharma PV. Suśruta Saṃhitā - Nibandha Samgraha Vyakhya; Dalhana Teekah, Sūtra Sthāna. Vraṇasrava Vignaneeya Adhyāya; Shloka no 8-15, 18. Ch. 22. Varanasi: Choukambha Orientalia; 6 th Edition, 1997. p. 240.